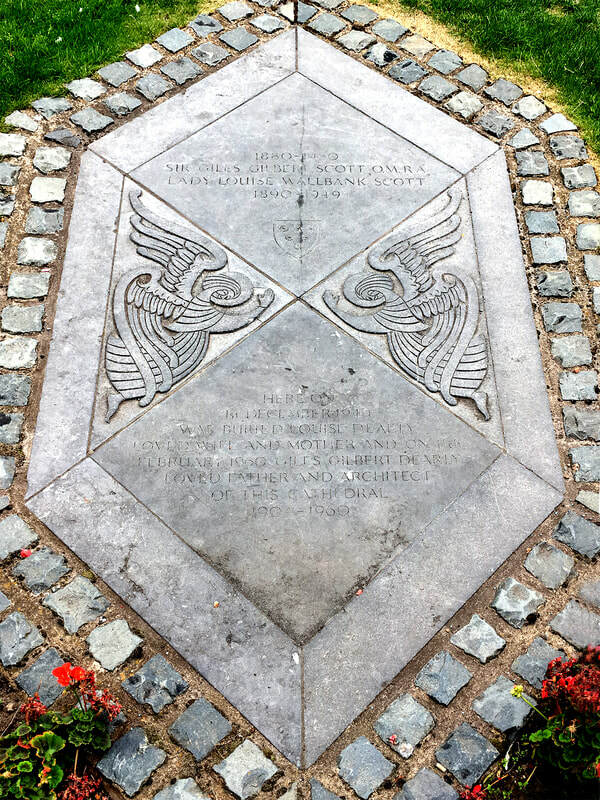 This year the society spent the 31st of July to the 3rd of August visiting the magnificent city of Liverpool, standing proudly on the Mersey, dominated by its two cathedrals, and containing a wealth of Victorian and later buildings. 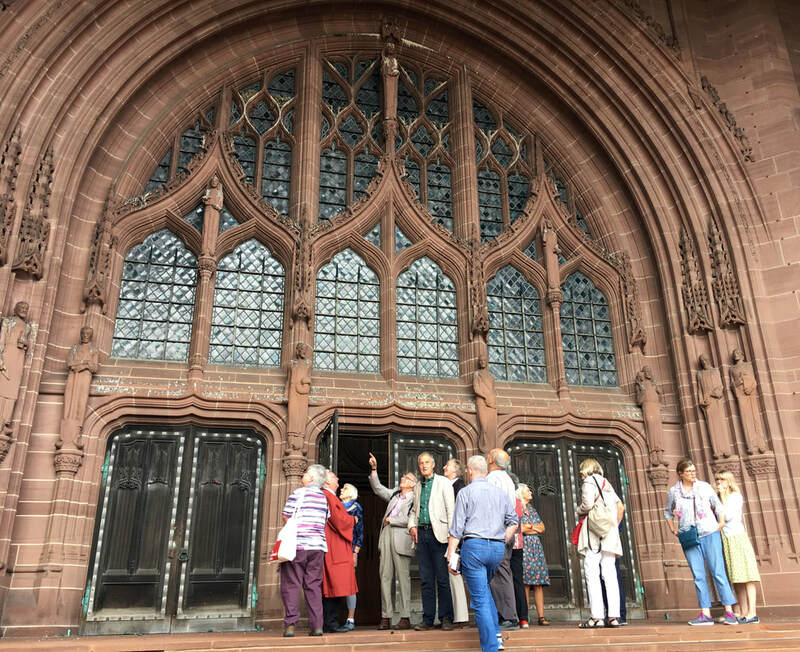 The tour, led by Dr Gerard Hyland, focused primarily on the work of Edward Pugin, Augustus’s eldest son and architectural heir, not only in Liverpool but also across the Mersey in the Wirral. Excerpts from Hyland's Briefing Notes and Historical Background given to attendees will feature here. On the first night our group met at the Philharmonic Dining Rooms for an introductory dinner. 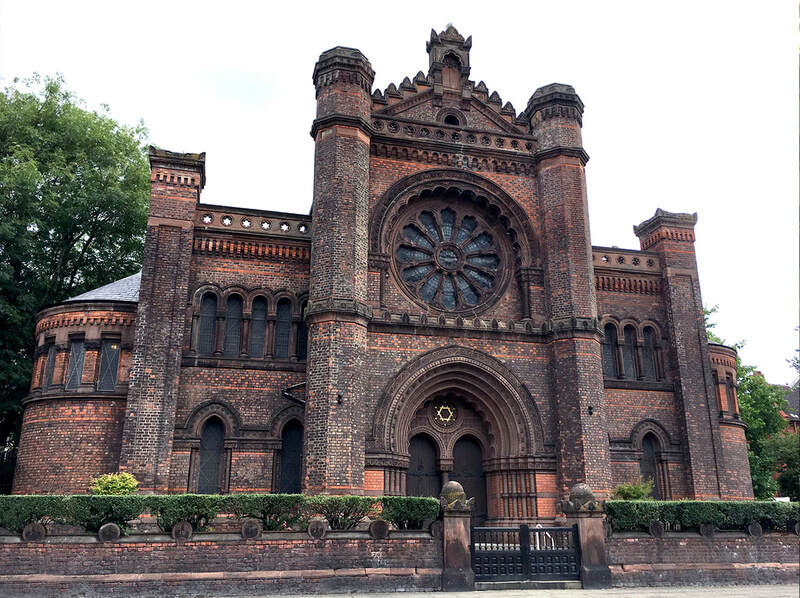 The following morning we departed from our accommodation at the University of Liverpool and made our way to Prince's Road Synagogue (right). This Grade I listed building by William and George Audsley contains both Gothic and Moorish elements and features an elaborate and ornate interior. 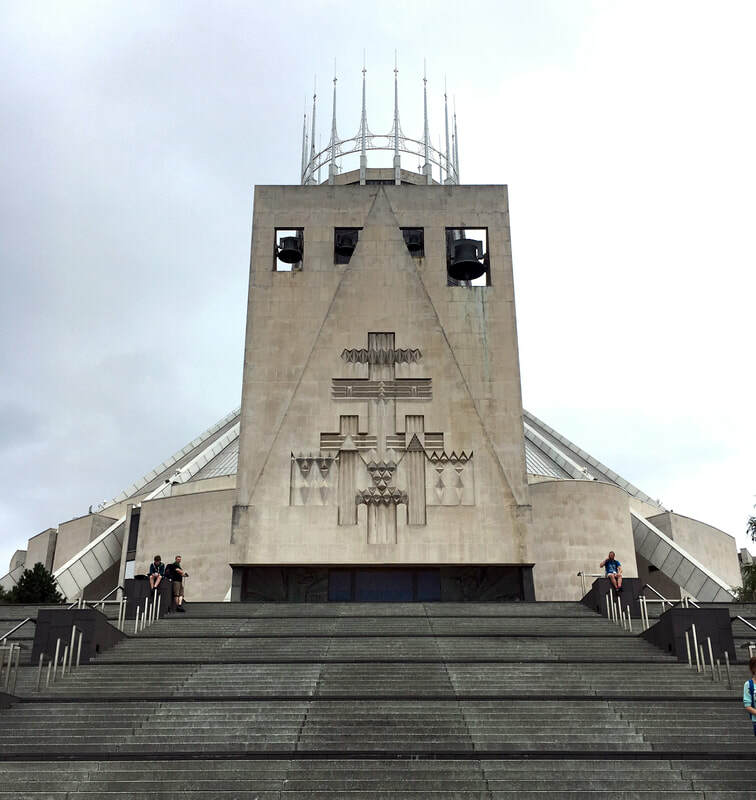 Our next stop was the Anglican Cathedral of The Risen Christ, (below), 1904-78, built by Giles Gilbert Scott and the site of his grave. 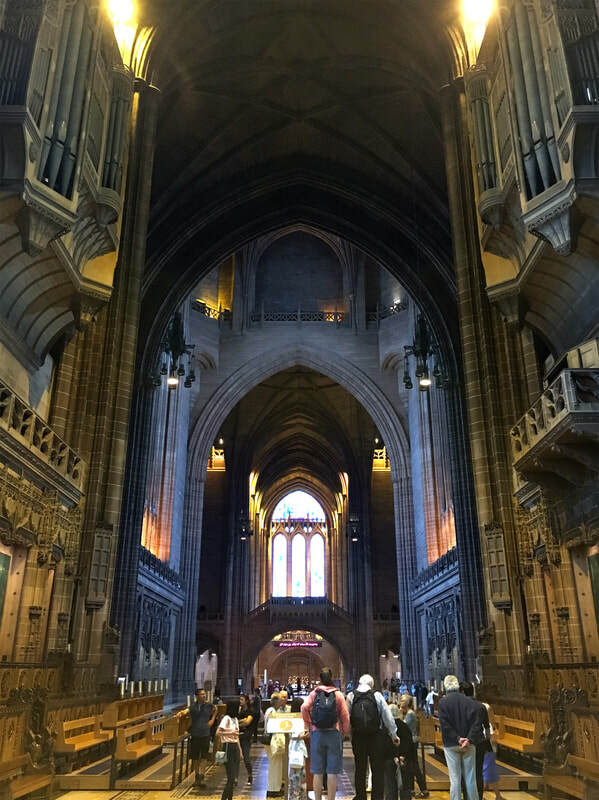 The largest Anglican cathedral in the world, the interior is an expanse of open space unencumbered by columns or structural supports. After lunch we traveled to Edward Pugin's church of St Vincent de Paul (left), built 1856-57. This was one of EW Pugin's earliest churches, designed when he was only 21. 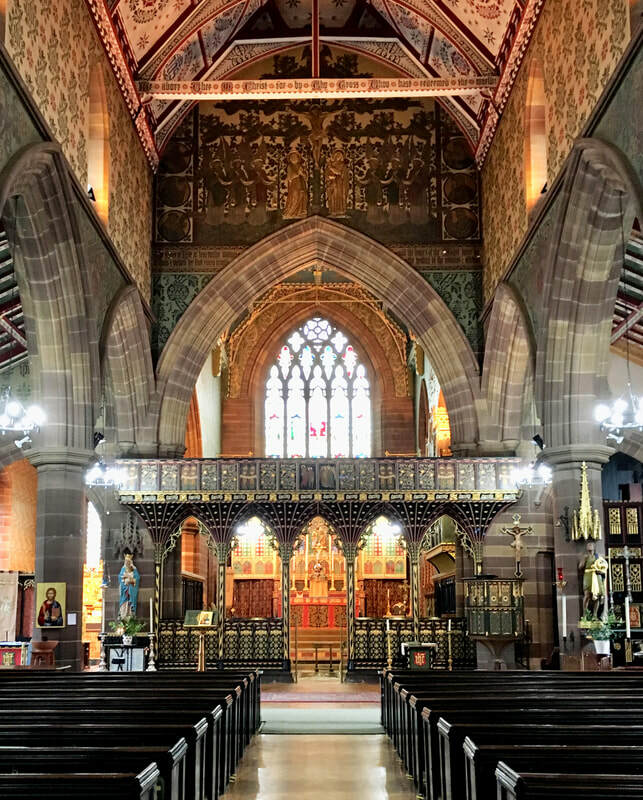 It is characterised by a distinct chancel under a lower roof-line than the nave, and the appearance of an attractive bell-cote, which was one of the first of many subsequently designed by EW Pugin. 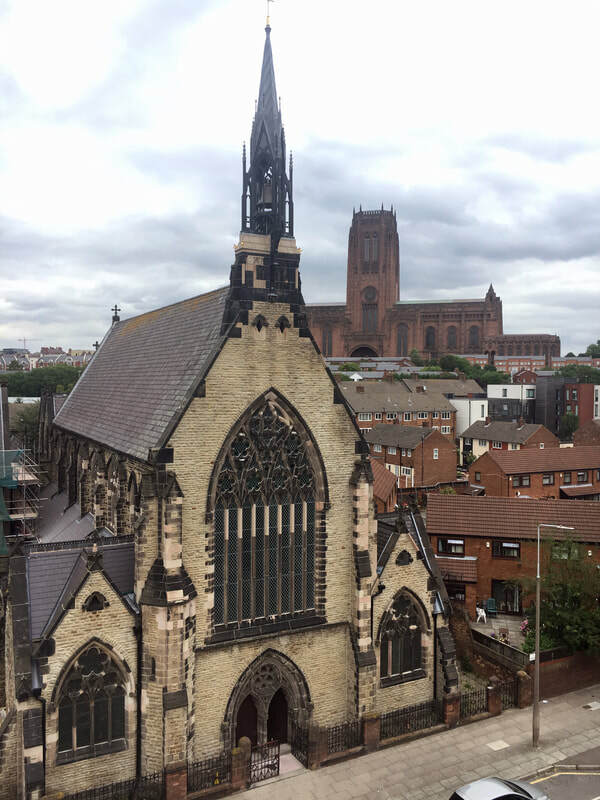 We first viewed the church from the upper deck of a nearby building, which allowed us to better appreciate the building and its placement - as the photo shows, the Anglican cathedral appears in the distance. We moved on to another of Edward Pugin's churches, the Grade II listed Our Lady of Reconciliation de la Salette (bottom left), 1859-60. This church marks the start of EW Pugin's second phase of church design, characterised by the replacement of the distinct chancel of his first churches by a shallow apsidal sanctuary that it is essentially an extension of the nave under the same roof-line with no demarcation between them. The church is undergoing serious structural repairs to secure the opposing walls from bulging out; damage inflicted by the careless installation of a bell-cote. 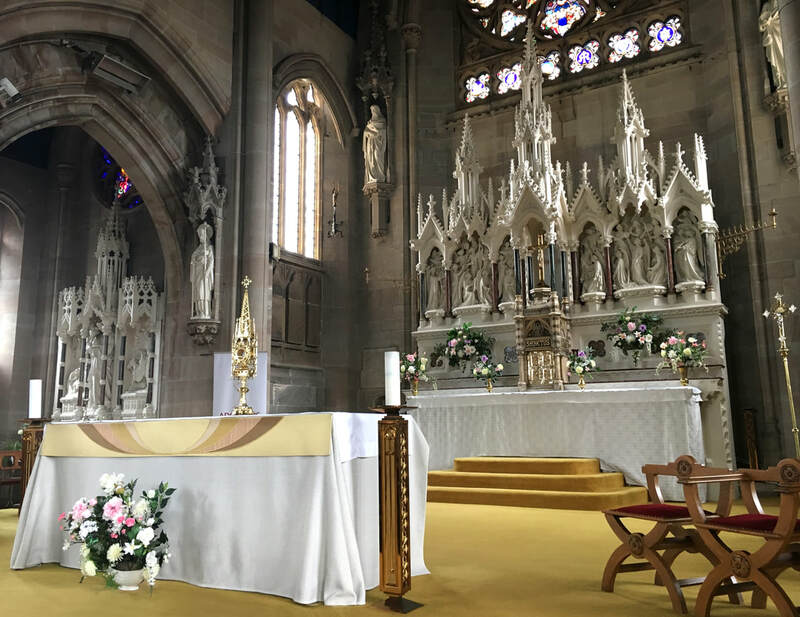 Additionally, the high altar and reredos were destroyed by fire in 1975, and the replacement is not in keeping with the church's original scheme. Our first day ended with a tour of St George's Hall (below), a Grade I listed building in Liverpool's city centre. 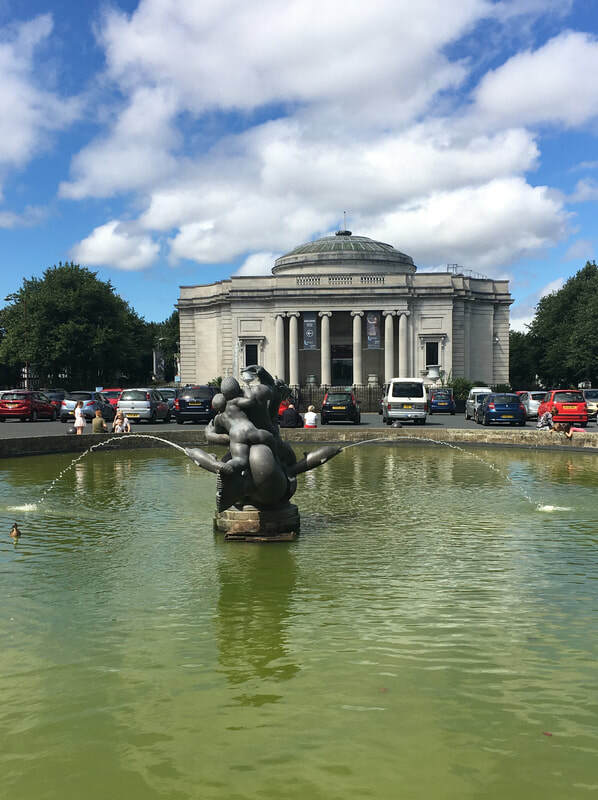 Designed by Harvey Lonsdale Elmes and described as 'one of the finest neo-Greco-Roman buildings in the world,' the building features the unlikely combination of concert hall and assize court under the same roof. Done for money saving reasons when first built, it was the largest building in the UK when it opened. 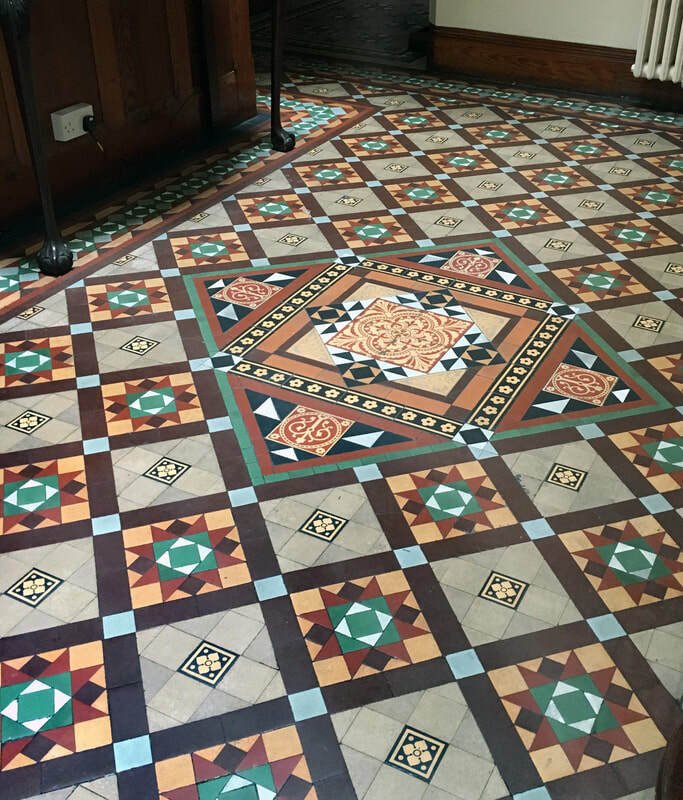 The concert hall has one of the finest Minton tile floors in the world; normally kept covered to avoid wear, it was on display during our visit. 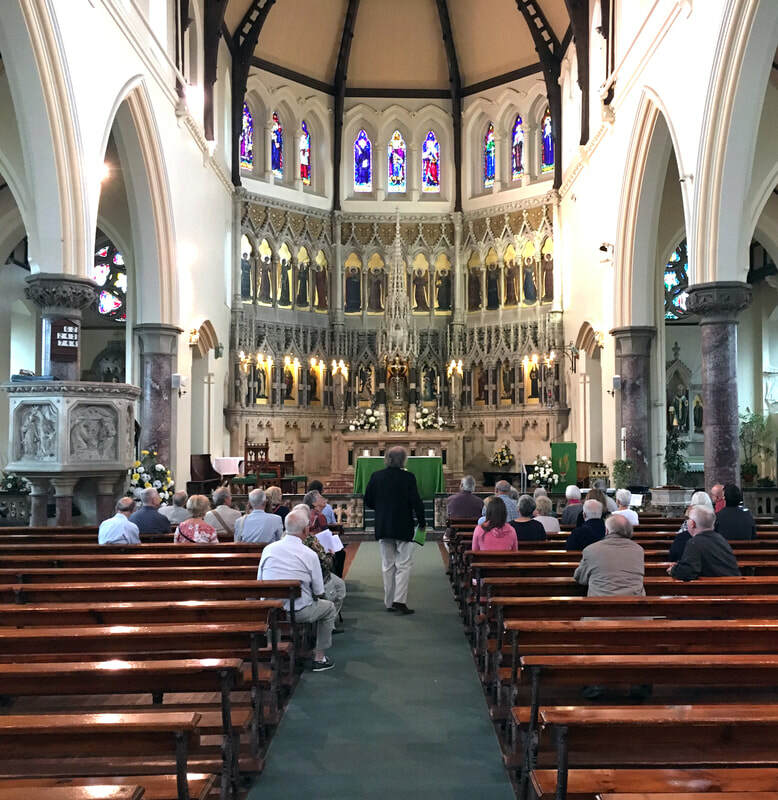 Our second day focused on the Wirral, starting with our trip through the Mersey (Queensway) Tunnel, built 1925-33, taking us to Our Lady of the Immaculate Conception, Birkenhead (below), 1860-62/74-77, the eighteenth church designed by Edward Pugin. Showing a significant advance and refinement over his previous churches, EW Pugin died before completing the project, and his siblings Cuthbert and Peter-Paul Pugin finished the work. 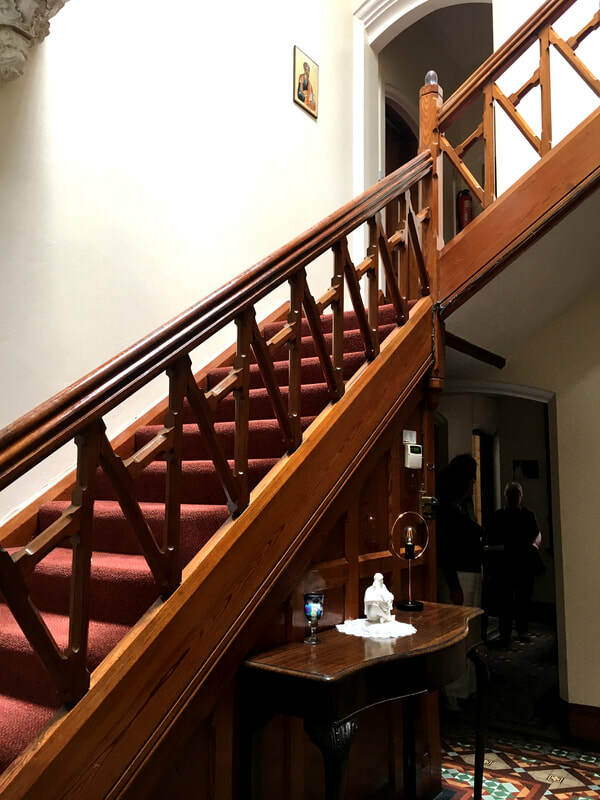 In addition to viewing the church, we were welcomed into the presbytery, revealing an intact Minton floor and a pinwheel staircase laid out in a similar way to AWN Pugin's house, the Grange. 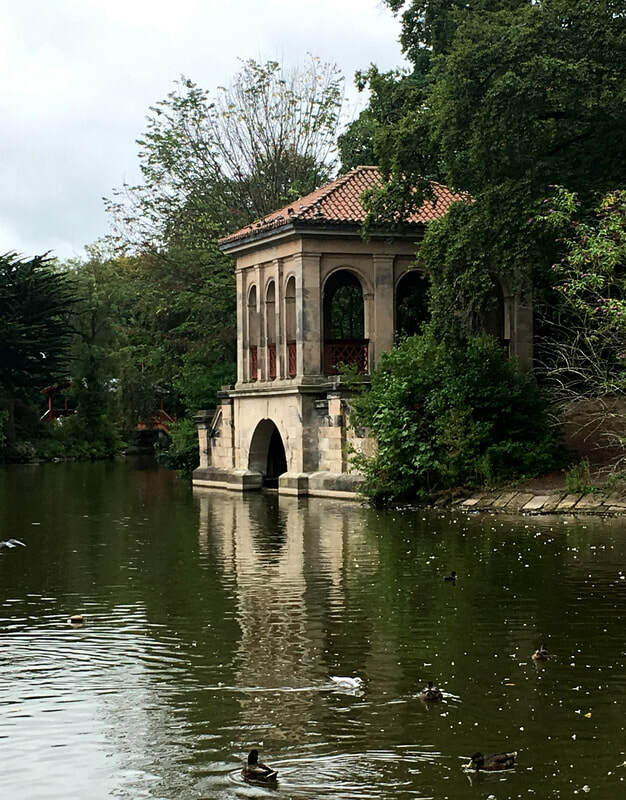 Before heading to the next church, we stopped at Birkenhead Park. 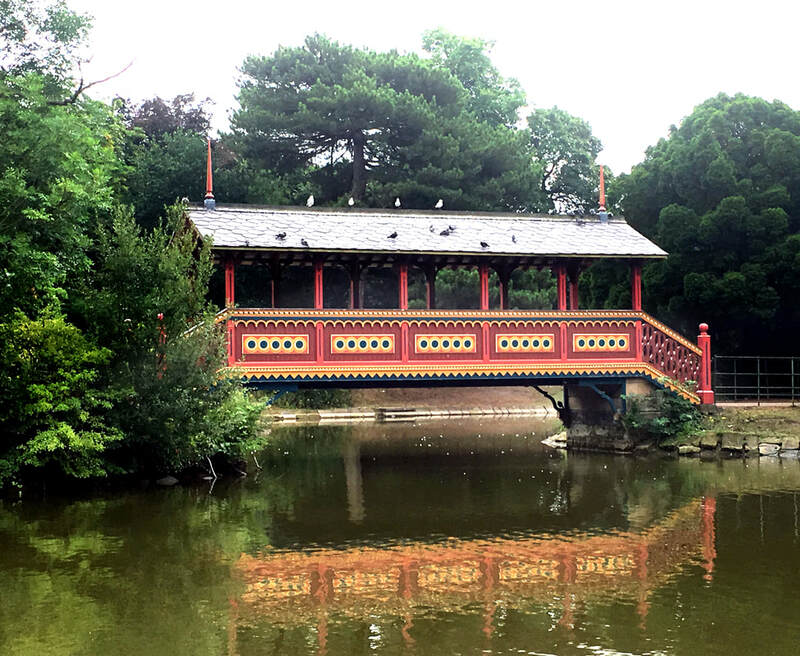 Opened in 1847 as the world's first publicly funded civic park, it includes 125 acres of parkland, lakes, gardens, and twelve listed buildings including the Swiss Bridge and the Roman Boathouse (right). St Anne's, Rock Ferry (left), 1875-77/1934 was EW Pugin's final church, the foundation stone of which was laid the month before his death. 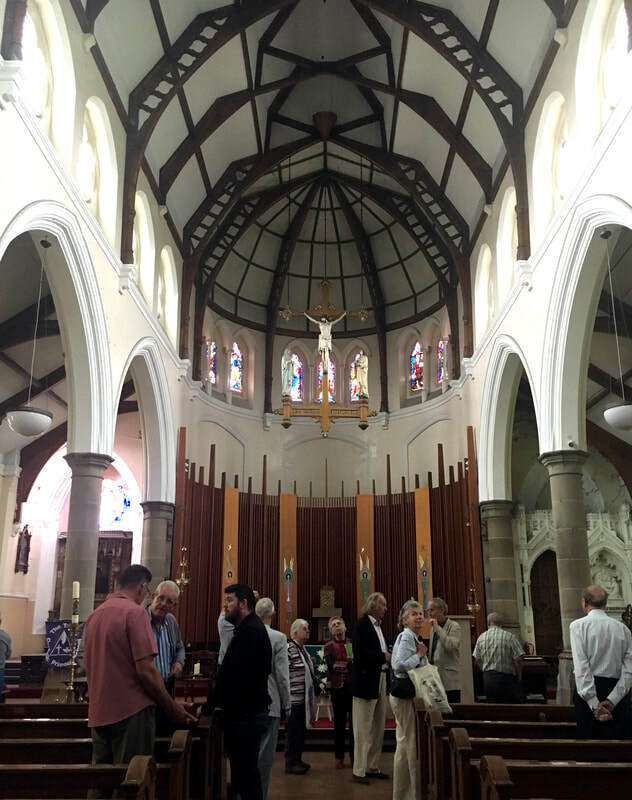 Like Our Lady in Birkenhead, this church was also completed by his brothers Cuthbert and Peter-Paul. In 1980 the church was re-ordered, destroying the original altar, pulpit, and font. Additionally, the chancel was furnished with Minton tiles, but the tiles were scuffed in order to secure the yellow carpet, causing irreparable damage. Leaving the last of our EW Pugin churches, we headed to Port Sunlight Village, a model village built 1888-1930 by the soap manufacturer William Lever provide accommodation for his workers. We were dropped off at the Lady Lever Art Gallery, free to spend the afternoon viewing the exhibits, having lunch, and exploring the village. 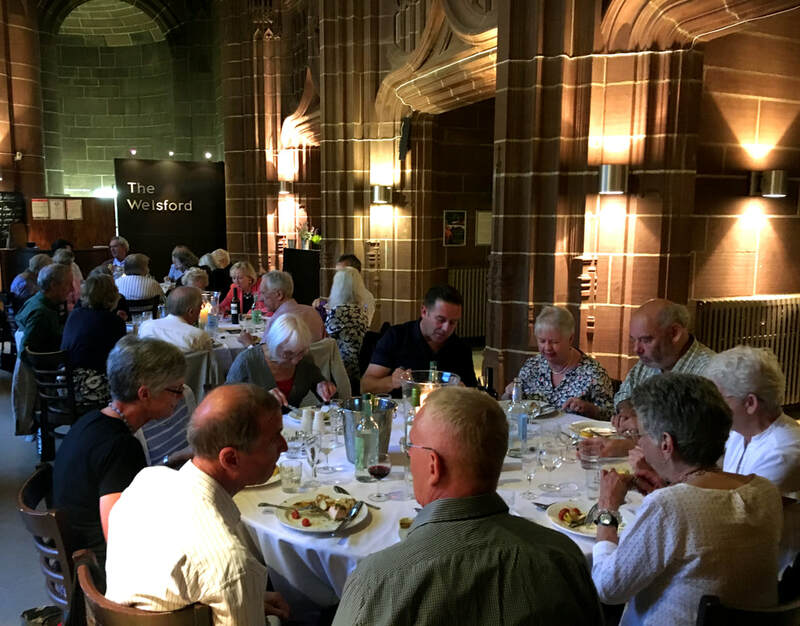 Upon reconvening, we returned to our accommodation to rest before the evening's meal at the Anglican Cathedral, although some used this free time to explore the city centre and follow the Beatles to the Cavern Club. Following dinner at the cathedral, we were allowed access to the now deserted building, giving us a chance to revel in the silence and stillness of the majestic structure. 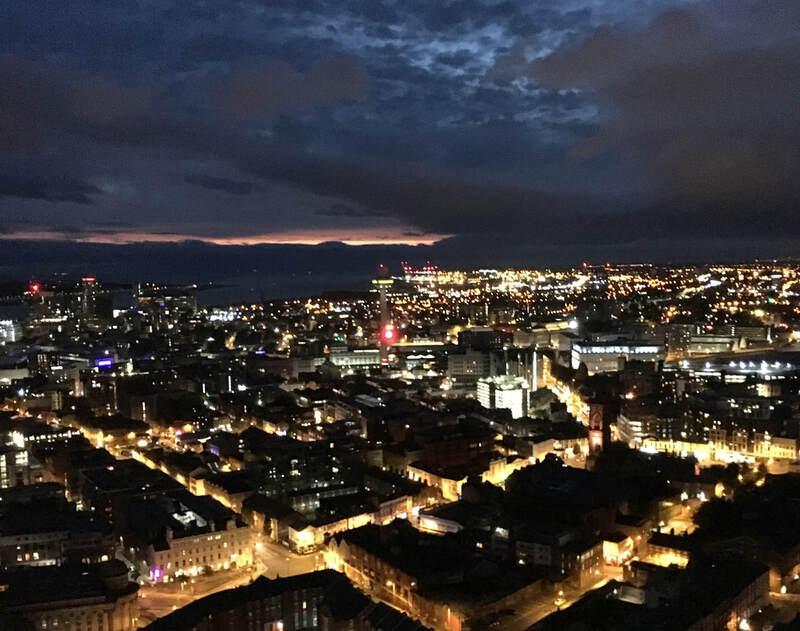 Between exploring the empty building and mingling with other society members, we had the opportunity to ascend to the top of the church's tower for a spectacular view. Two lifts and 180 stairs later and the city stretched out as far as the eye could see. It was a truly spectacular evening for all involved. The morning of our last day found us boarding the coach to our first destination, St John the Baptist, Tuebrook (left), 1867-70. 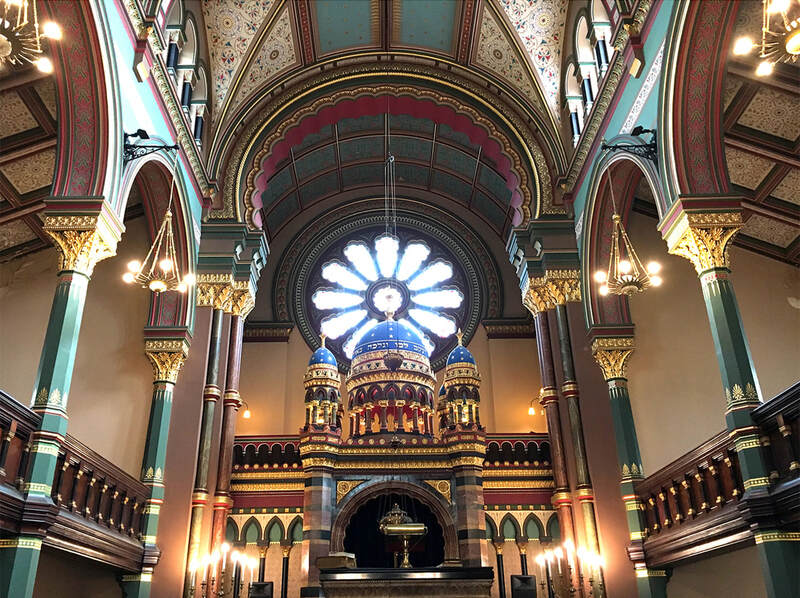 Built by George Frederick Bodley, this Grade I listed building is described by Eastlake as taking 'the foremost rank among examples of the Revival,' while Pevsner states that it 'is glorious and highly coloured' due to the 'resplendent display of Bodley fittings and the vibrant decoration.' The rood screen and ornate decor certainly reminds the viewer of AWN Pugin's church of St Giles, Cheadle. Leaving Bodley's church, we headed for our final stop: the Metropolitan Cathedral of Christ the King, 1962-67, by Frederick Gibberd. This modernist Catholic church rests on top of Lutyens' pre-existing Classical Byzantine crypt. 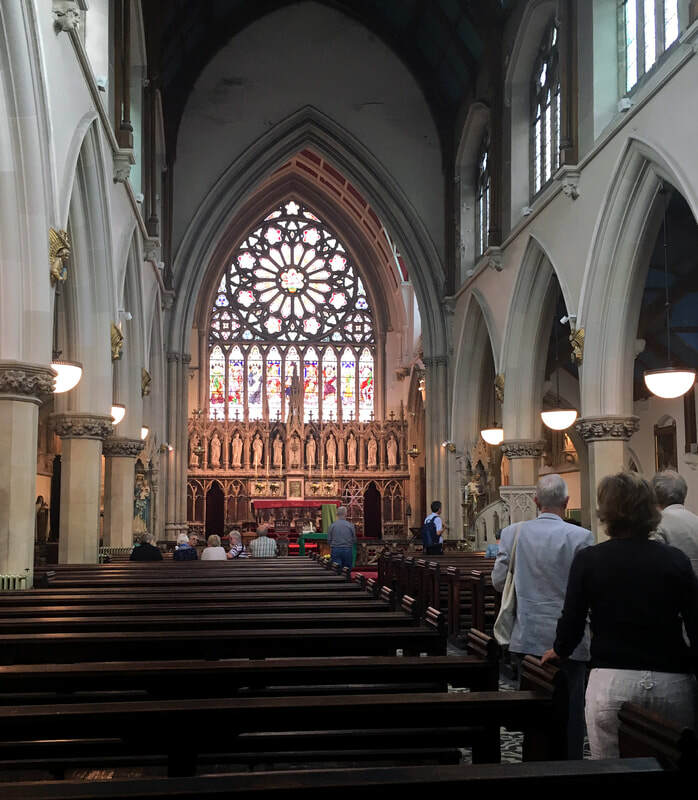 This church marks the culmination of an extended effort by the diocese of Liverpool to build a cathedral - AWN Pugin presented the first unbuilt design in 1845, followed by EW Pugin's design in 1854. Edward managed to complete the lady chapel and east chapels of this first cathedral, but work stopped and these portions were used as a church until their demolition in 1980. 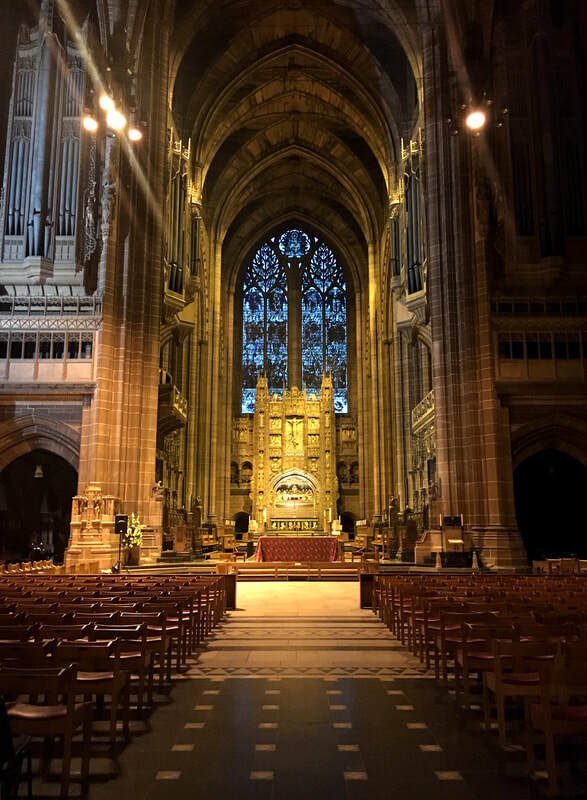 Many thanks to our Events Coordinator Julia Twigg and the tour convenor Gerard Hyland for an enjoyable trip throughout Liverpool and the Wirral.